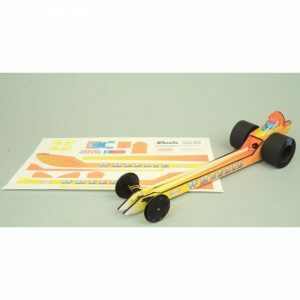 The wrap is a very simple way to decorate your AeroRacers or GADD racer. Simply download the available pdf file from the product page on our website. Import the file into your computer and use the line art to color your wrap using basic software like CorelDraw or similar. Once you complete the decorating, simply print your file on legal paper (8.5 x 14 inches). You may also just print one of our pre-colored versions or print our basic line art file and then decorate it with markers. We recommend you use regular white or bright white paper (20 lb stock works best) for printing. Do not use sticker material as it does not work. Once you have printed out your wrap sheet, use scissors to cut out the parts. Trial test the part before you apply glue to it. Apply white or Elmers glue to the back of a small part (not a side or a main top part). It is a good idea to place a piece of wax pa-per over your building surface to prevent getting glue onto the furniture. Use your fingers to spread the glue thinly over the entire wrap piece back. Wipe your glue spreading fingers on a paper towel so you do not get the glue the front of the wrap piece as you handle it. Apply the wrap piece to the racer, slide it into the correct position and smooth it down with your fingers. Wipe off any excess glue. Let it dry. Please note that on most of our designs, we choose to make the body side a little taller (about 1/8”) so you can bend it over at the top where it is to meet the top wrap part. Apply glue to the body side wrap back part, slide it in position onto the racer and fold over the excess at the top. Repeat with second side. After you have glued both body side wraps into position, only then you glue the top body wrap down. It of course will go over the small fold-over parts from the side to create a seamless look. Hint: We choose to make the cuts where you would need to make a cutout inside the wrap. Do not worry about axle holes. It is easiest to punch through the paper wrap with a hobby knife or scissors to open up the covered hole later. Not all surfaces are going to be covered. If you look at the pic-ture on the right you can see that we used a black marker to cover the wood sides that are not covered by the wrap. Use your imagination to create a replica of your favorite racer by collecting logos from the web or creating your own names for your racers as well as wicked designs. We would love to see what you come up with. Send us a pic of your racer.